John began his coaching career at the age of seventeen in the local sandlot leagues of his hometown, Youngstown, Ohio. His 16 year run finished with a NABF National Championship with his Miller Brewing summer collegiate team in 1986. John started his college coaching career as an assistant at Youngstown State University in 1980 under Coach Dom Roselli. He went on to assistant coaching positions at Miami Dade North C.C., Palm Beach C.C., and Indiana University. He was hired in the fall of 1987 as the third head coach in YSU history where he served from 1988 to 1991. His YSU Penguins set the school record for wins in the 1991 season. In 1992 Coach Zizzo left YSU for the expansion Colorado Rockies as a scout and minor league hitting coach. He was also a minor league field manager in professional baseball for the Sioux Falls, SD Canaries and Canton, OH Crocodiles. 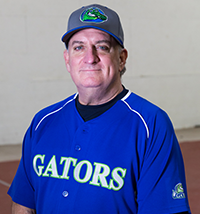 He most recently managed the North Shore Navigators in the Futures Collegiate Baseball League for three seasons 2015 to 2017. John has three children Jonathan, Stefanie and Jack. Phil was born and raised in Youngstown, Ohio. He is a 1983 graduate from Youngstown State University with a Bachelor’s degree in Business Administration. He worked as a nursing home administrator for thirty-two years. Phil played baseball for two years under Coach Dom Roselli while at YSU, and two years in Miami, Florida, at Miami Dade Community College, and St. Thomas University. Phil was a player/manager in the Youngstown AA Baseball League, winning nine Championships in twelve years. Phil was inducted into the Youngstown Curbstone Coaches Hall of Fame in 2010. Phil lives in Boardman, Ohio, with his wife of thirty-two years, Mia Panno, and his children, Phillipp Jerome, twenty-one, a student at EGCC, and Angelina Rose, eighteen, a senior in high school.